I have added my own little twist to the 50s dress with the knotted shoulder straps. I explain how to do that a bit further on. I have long admired these gorgeous skater dresses (left) in Ted Baker and they were really the inspiration for my choice of fabric. 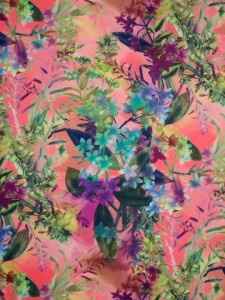 There are a lot of tropical prints around at the moment but I was particularly taken with this amazing tropical Hawaiian scuba in my favourite fabric den, Fabworks. (They have a great range of scubas and deliver worldwide now should you be tempted. Prices from £5-6 per metre.) You may remember my first project with scuba – the black snake skin dress. I was so pleasantly surprised with the results that I thought I’d give the scuba fabric another go on something completely different. The Veravenus pattern comes as a UK size 10 – that’s a US6. I’m a 12 so I just added on half an inch to the width of each of the bodice panels. The instructions are really clear although I would say the shape was fractionally short in the body for me. (I’m 5ft 8 – that’s 173cm) I wish I’d cut the bodice an inch longer. For help scaling this pattern up or down, have a look at my Making a pattern fit page which tells you how much to increase or decrease for each size – NOTE: be aware that the increases on my page are from a size 12 whereas this pattern is a size 10. To make the ties you just need draw out this shape on the right and add it to the shoulder straps on the front and back bodice – don’t forget to add it to the facing as well! (I forgot and had to add it on afterwards.) I would secure the 2 ties together where they would normally have joined, by crossing them over and running a line of stitching across. See diagram below. This allows you to tie a pretty knot that ends up in the right place. Scuba fabric works perfectly for a dress like this. I am so converted to scuba. I have gone from feeling it was a bit trashy and cheap looking to LOVING using it. It is so INSTANT RESULTS. It holds its shape really well, and is VERY easy to work with. The only thing is that it is a little bulky and I spent quite a bit of time snipping away any excess fabric on the pleats to make it sit well. It also feels lovely to wear, very soft and smooth, although I’m not sure it would be so great in a hot climate. I think it might be a bit sticky!